I am relatively new to the South. I have moved all around the country the last two decades, and have finally landed in Texas. And if there is one thing I have learned while living in the Lone Star State, it is that the locals take their patios seriously. 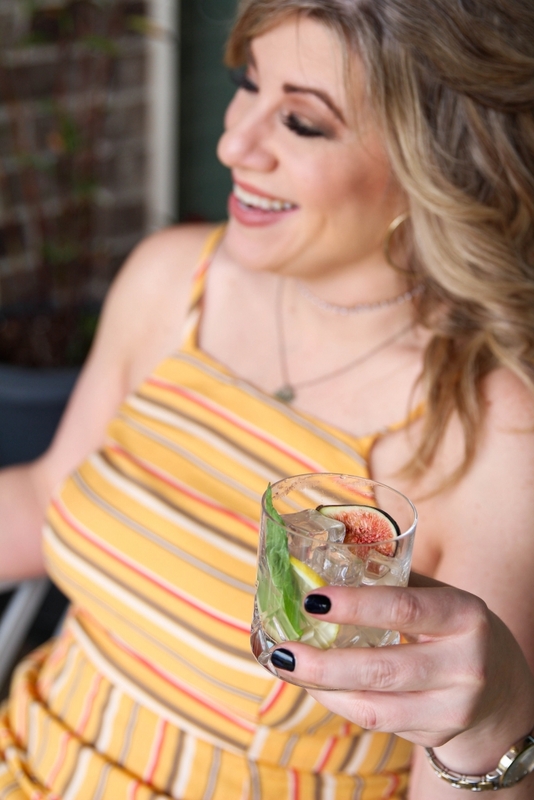 Southern Patios are sacred spaces of relaxation, warmth, and most importantly, laughter. There are few key ingredients to putting together a traditional Southern patio. First you’ll need a big space. Southern patios are big and you’re going to need to have some room to stretch out. Second, you’re going to need some comfy furniture. 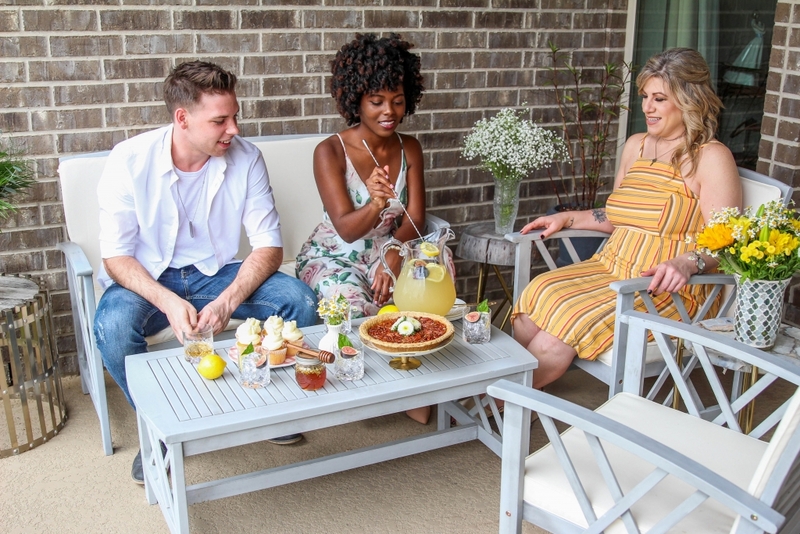 Be it a hammock, some rocking chairs, or nicely padded lawn furniture, make sure your guests will be cozy enough to stay for hours. Lastly, I recommend you deck the place with flowers. It’s Spring, isn’t it?! Flowering up the space will be the perfect garnish on your patio cocktail… see what I did there? 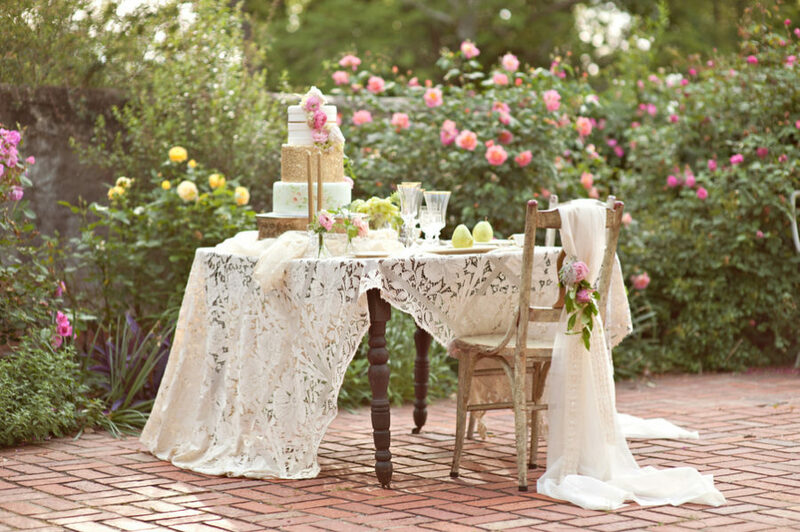 So even if you don’t live in the South, find a outdoor space, make it cozy, and get ready to entertain. Every celebration has to have a theme. Seriously! Children’s parties get themes, so why can’t us adults get in on the action?! For my Spring Fling, my theme is honey! 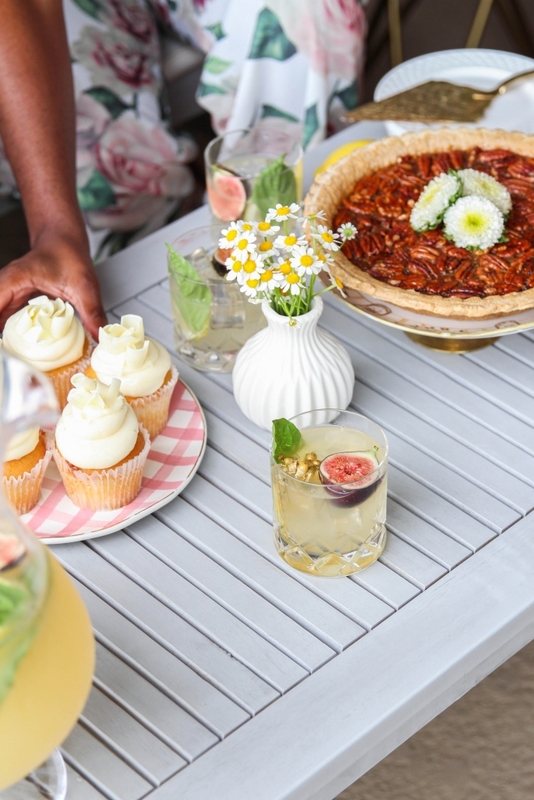 Evan Williams Honey, a honey-based cocktail, honey cupcakes, and a honey-glazed pecan pie. Plus with all the bees a-buzzing as Spring kicks in, it is truly a perfect theme. 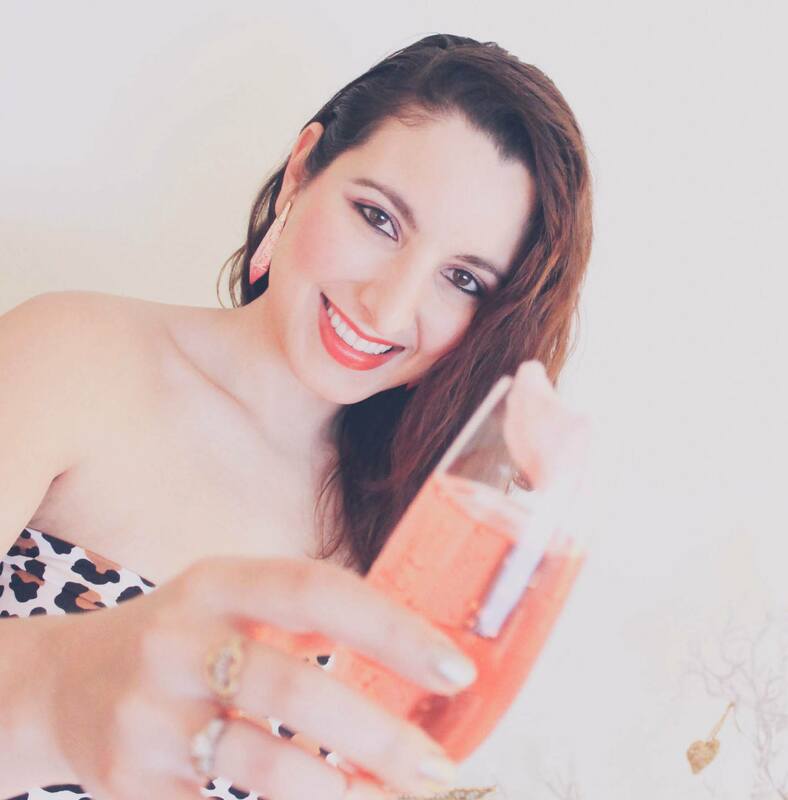 If you want to do a party right, then it has to have a signature cocktail. 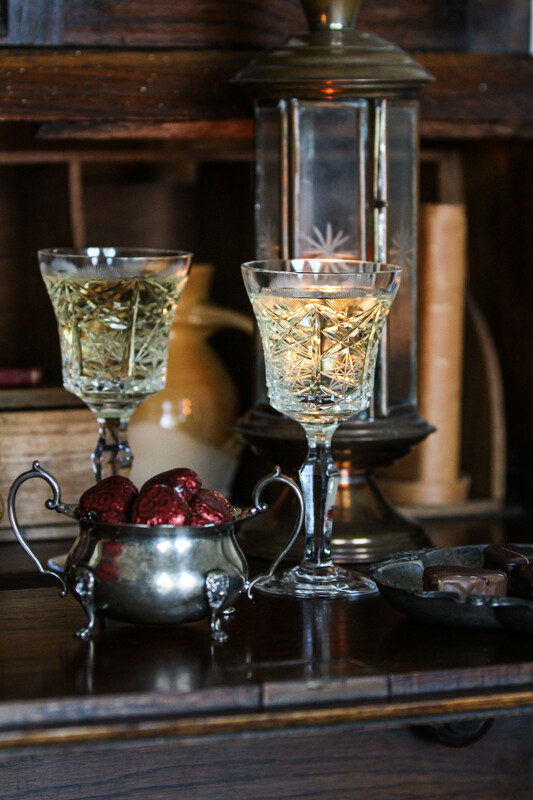 Even the most casual of gatherings should have a special drink made just for the occasion. It may seem like a bit of overkill for a patio gathering with friends, but trust me, the extra effort will pay off. 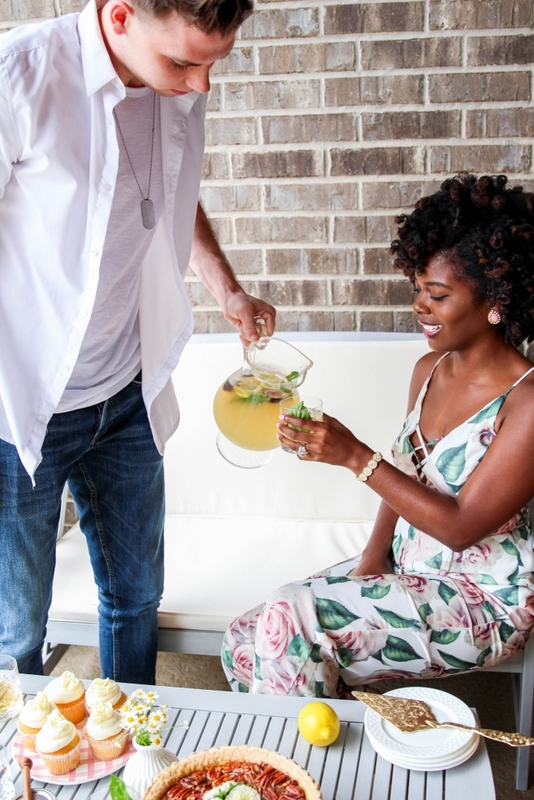 Not only will you be able to show off your mixology skills as you whip up a fabulous drink for your guests, you will also quickly claim the title of most thoughtful host. It is seriously a win-win. 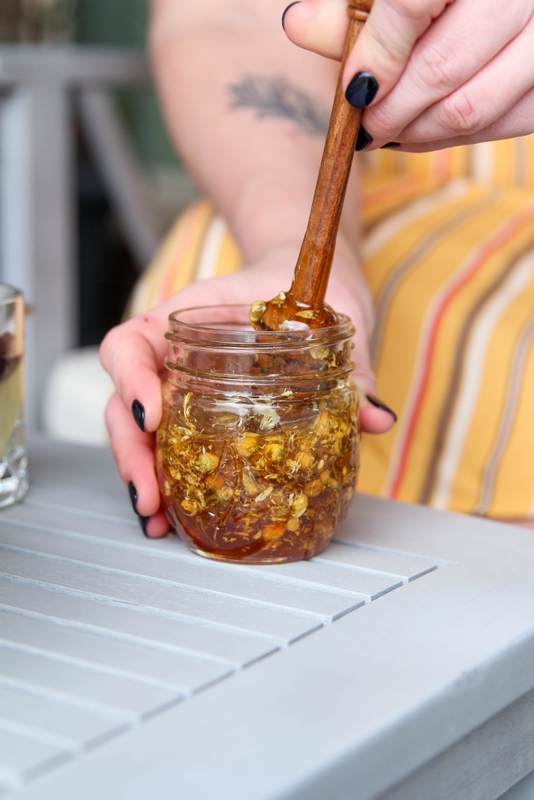 The day before the gathering, add two tablespoons of dried chamomile to a small jar of honey. Let the flowers infuse the jar overnight in preparation for the party. 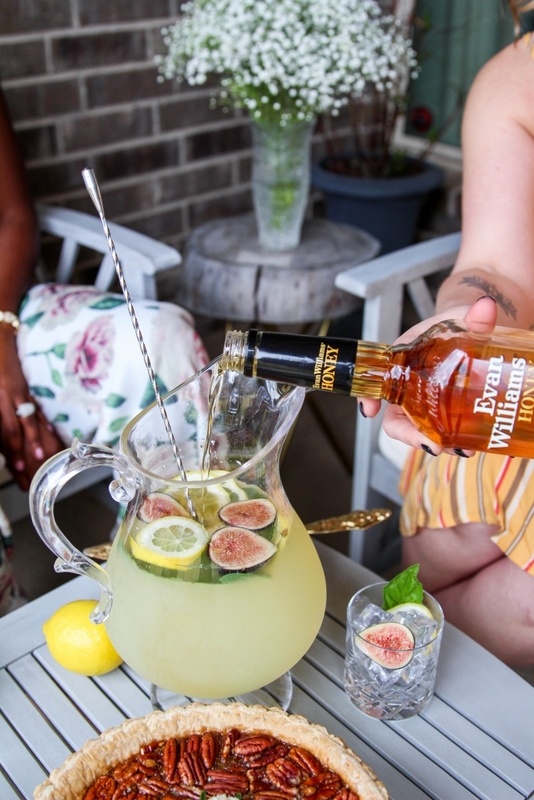 To make the cocktail, mix together the Evan Williams Honey and fresh squeezed lemonade in a large pitcher. Add in some fresh basil leaves, lemon slices, and halved figs to seep. Pour the cocktail into tumblers over ice and garnish with additional fresh basil leaves, lemon slices, and halved figs. 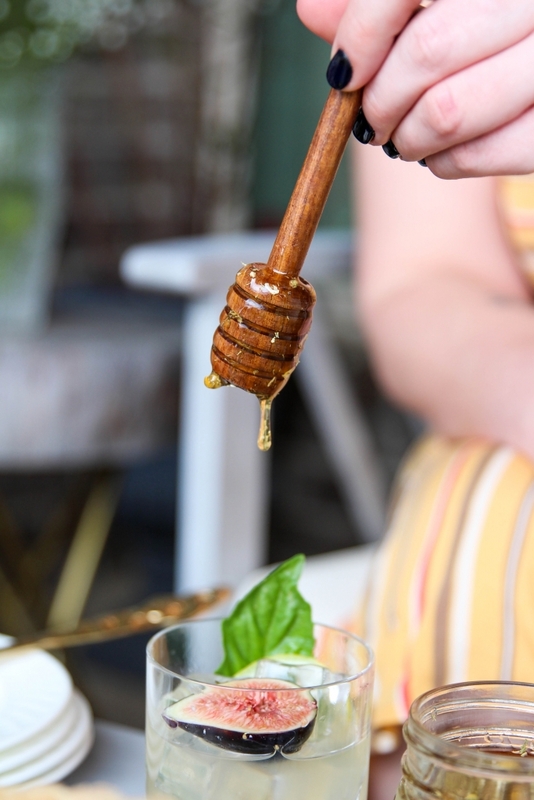 Lastly, use a honey dipper to drizzle the chamomile-infused honey syrup over the top of the drink. Enjoy! This Honey Whiskey Lemonade is ridiculously easy to make. 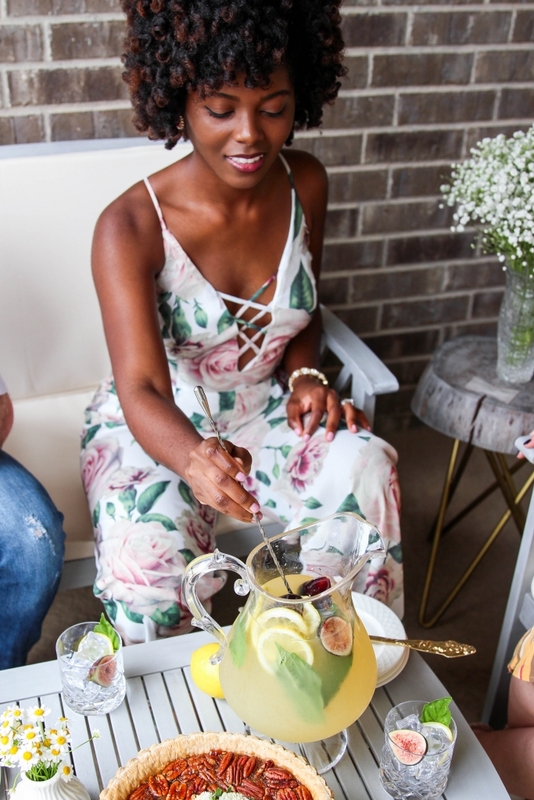 I personally like easy signature cocktail recipes for parties. 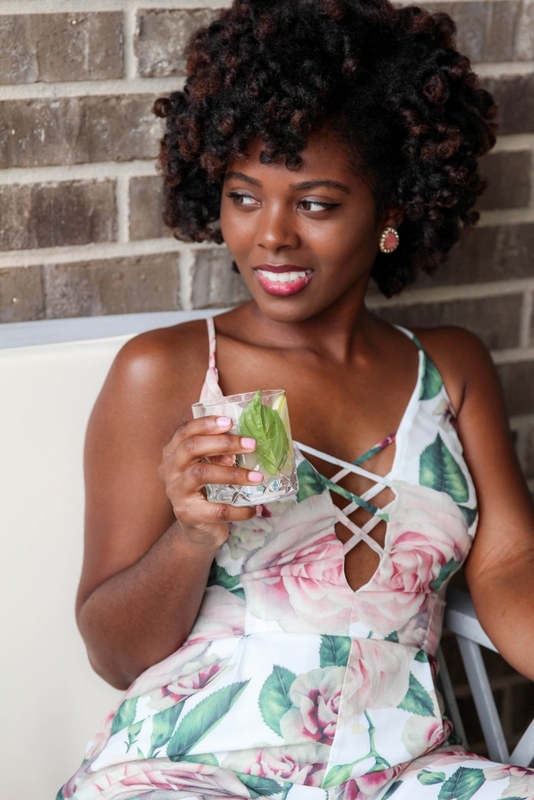 When the cocktail is easy, you as the host can do less mixing and more mingling. 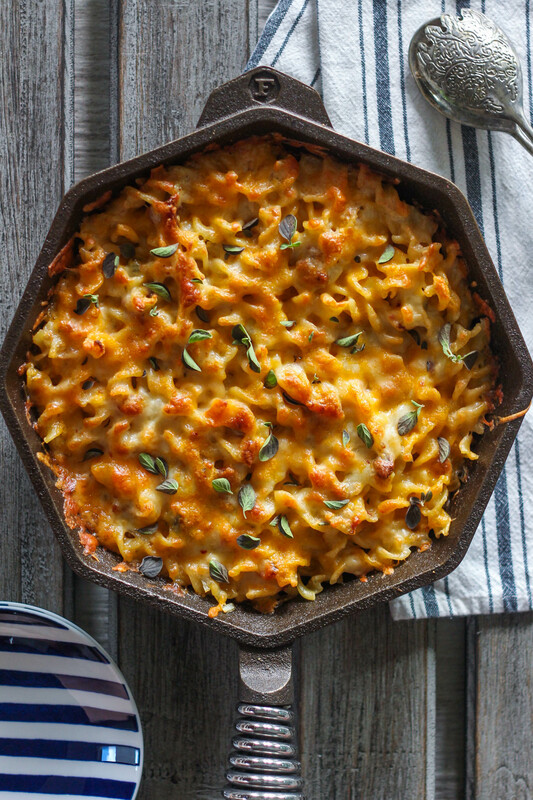 But, just in case you need a little hand-holding, let’s walk through the recipe together…. 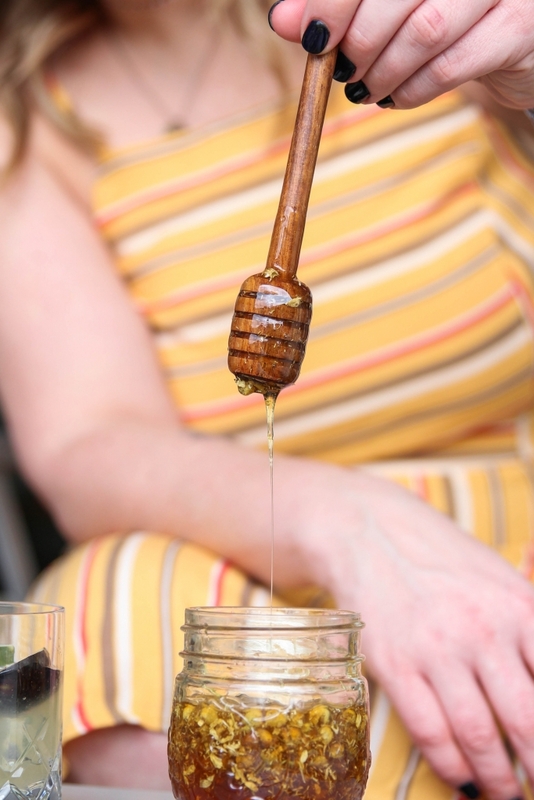 First you’ll want to create the chamomile-infused honey syrup. The day before the gathering, add two tablespoons of dried chamomile to a small jar of honey. Let the flowers infuse the jar overnight. Next you’ll want to mix the 4 cups of fresh squeezed lemonade with the cup of Evan Williams Honey in a large pitcher. 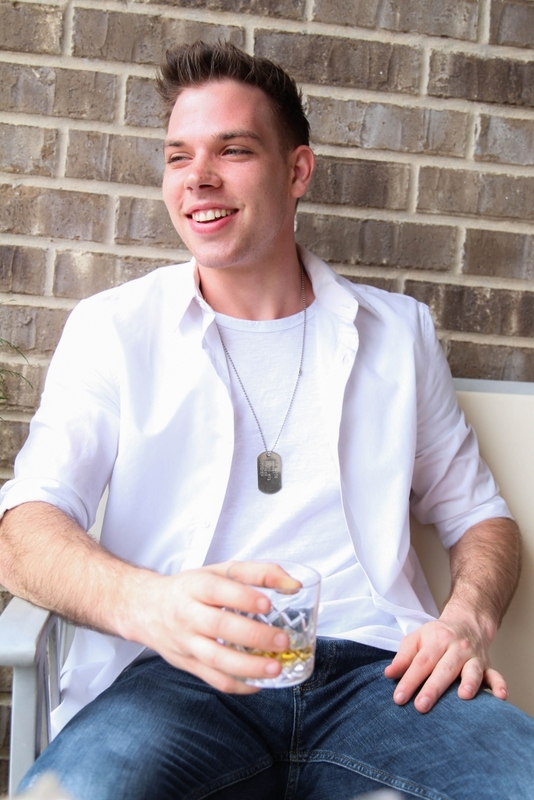 Personally, this is why I like always having Evan Williams on hand. It’s easy to enjoy simply on its own or in a cocktail. Make sure you have some fresh basil leaves, lemon slices, and halved figs in there to seep. Pour the cocktail into ice-filled tumblers. I also recommend garnishing the drinks with individual lemon slices, basil leaves, and halved figs. Lastly, top it all off with a drizzle of razzle-dazzle! 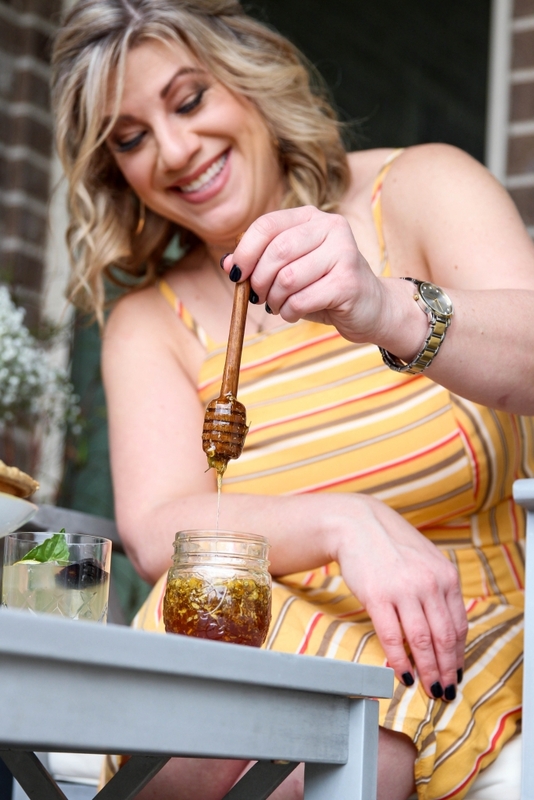 Use a honey dipper to drizzle the chamomile-infused honey syrup over the top of your guests’ drinks. 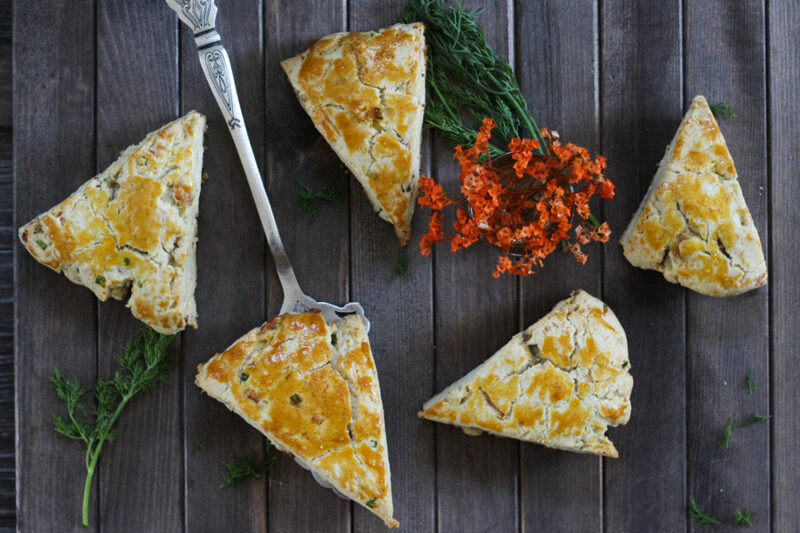 This will tie in the theme beautifully and make for a spectacular garnish. 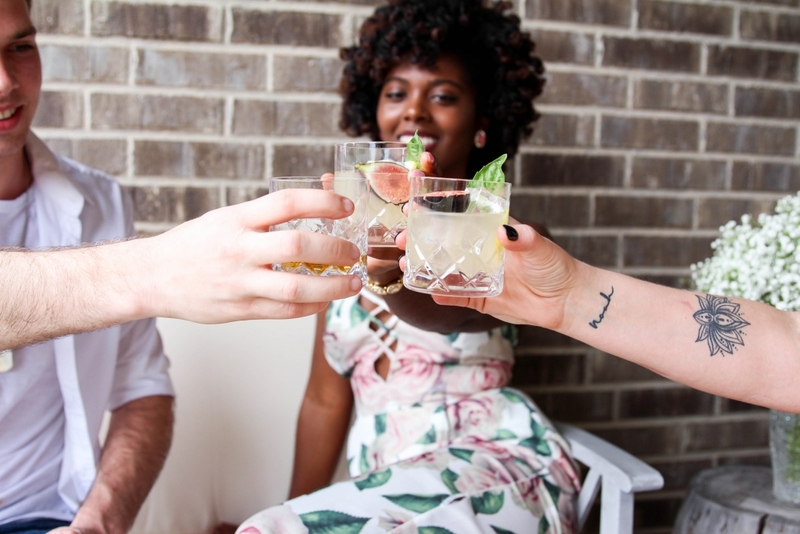 You will inevitably have a guest that prefers their drink neat. 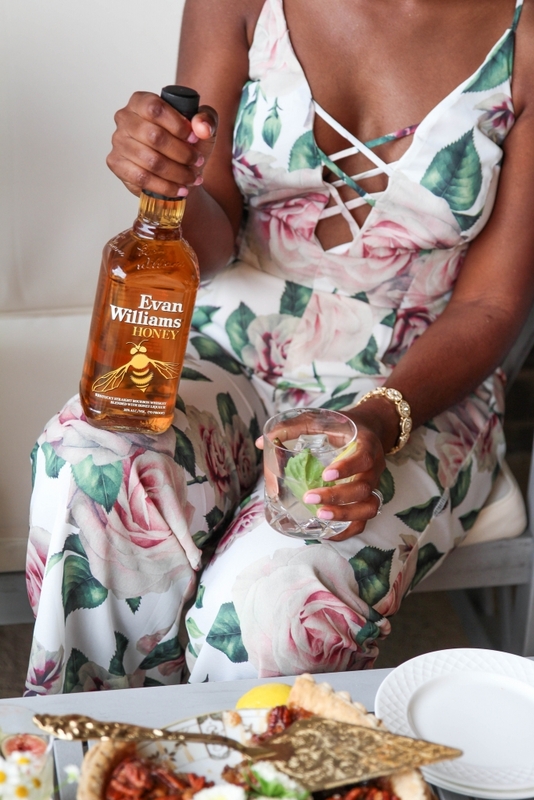 So I recommend having a bottle of fabulous liquor like Evan Williams Honey available. And trust me, they won’t be disappointed. 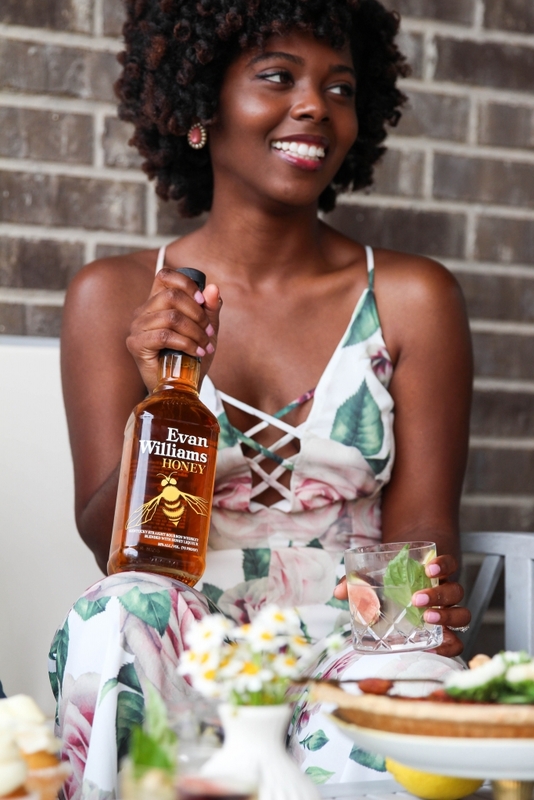 I absolutely love Evan Williams Honey! 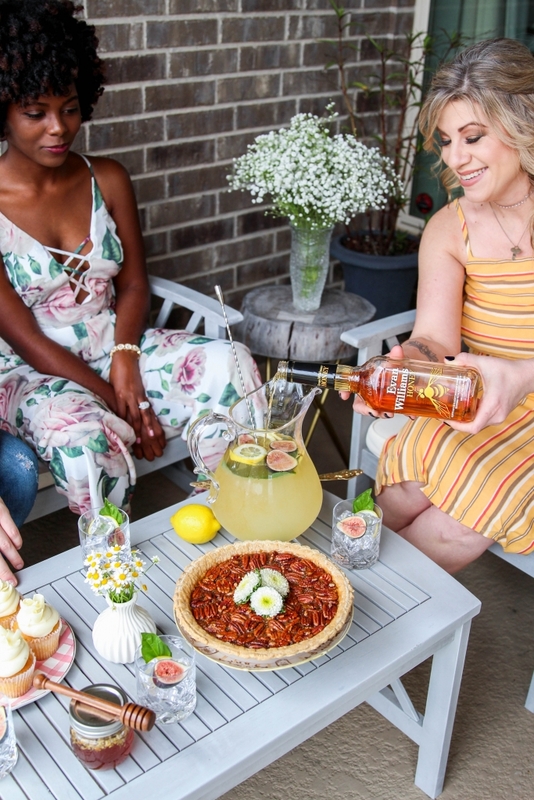 It is a Kentucky straight whiskey blended with natural sweetness of honey, so you know even the most discerning of party-goers is going to enjoy a bit of sipping. 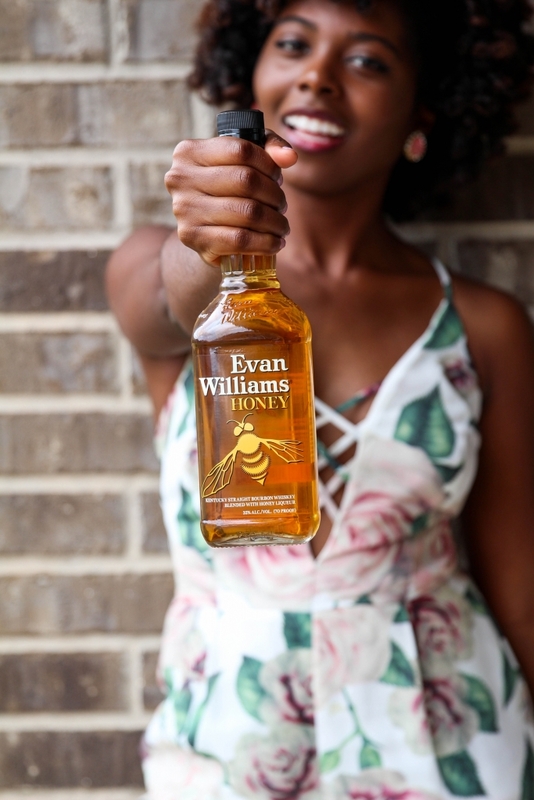 It combines the great taste of honey with the smoothness of Evan Williams and is 70 Proof with soft, citrus honey taste. 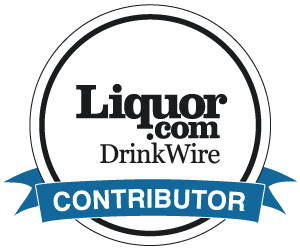 It is really an ideal liquor to offer your guests in the warmer Spring months. 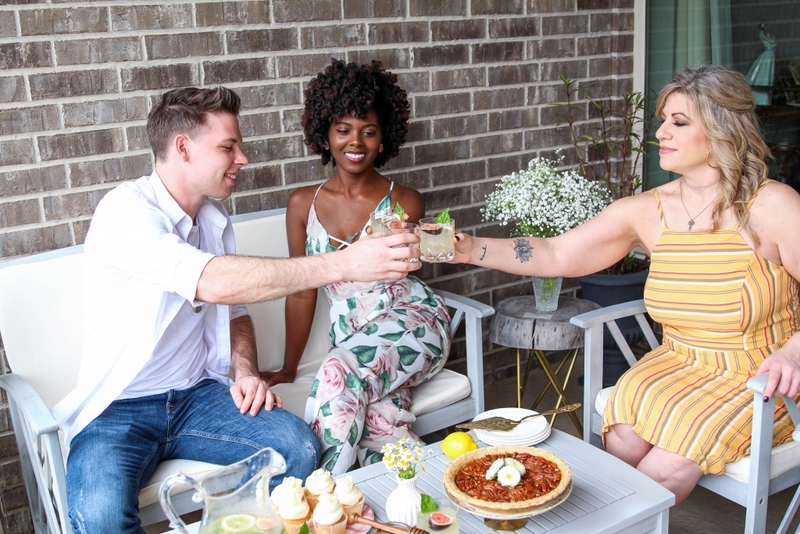 If you are new to a town, like me, then I suggest using your patio to make new friends. Send out a pigeon, invite the neighbors, or encourage a friend to bring someone you have never met. 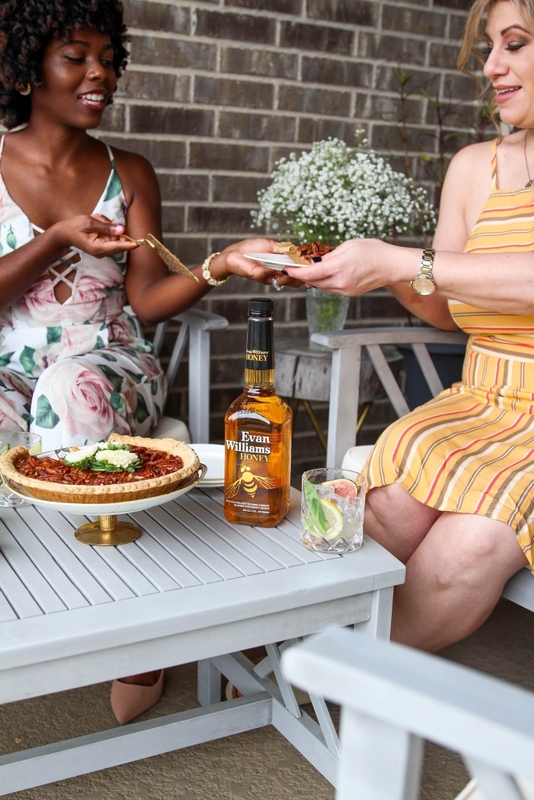 No matter how they get to your porch, this is an opportunity to celebrate new beginnings with new friends. I personally used this opportunity to make new Houston-area friends. Like I said, I’m very new to Texas and slowly growing my photography business. So I sent out a message to a local group of fellow industry professionals about my shindig and was lucky to get some RSVPs. 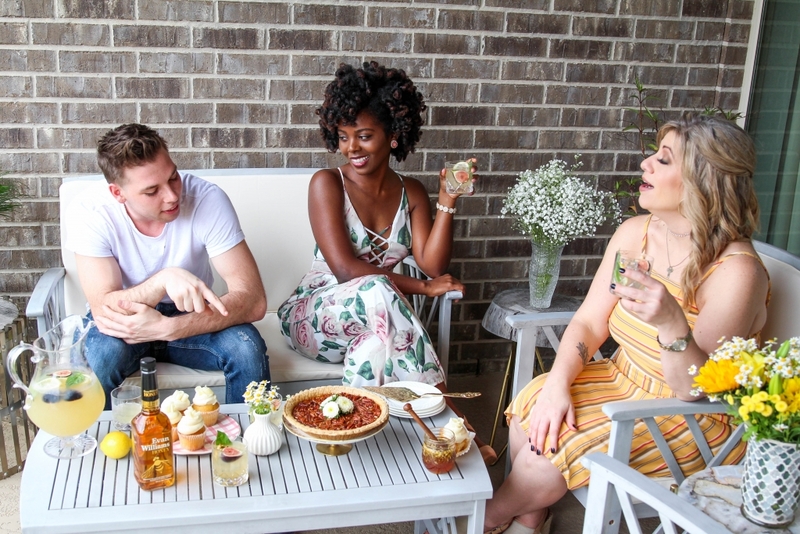 In true Southern fashion, Alicia, Kelsie, and Brandon came with warmth and welcome in their hearts. What initially started as a networking meet & greet on a lazy Southern patio, quickly turned into a fun party. The honey theme worked like a charm! 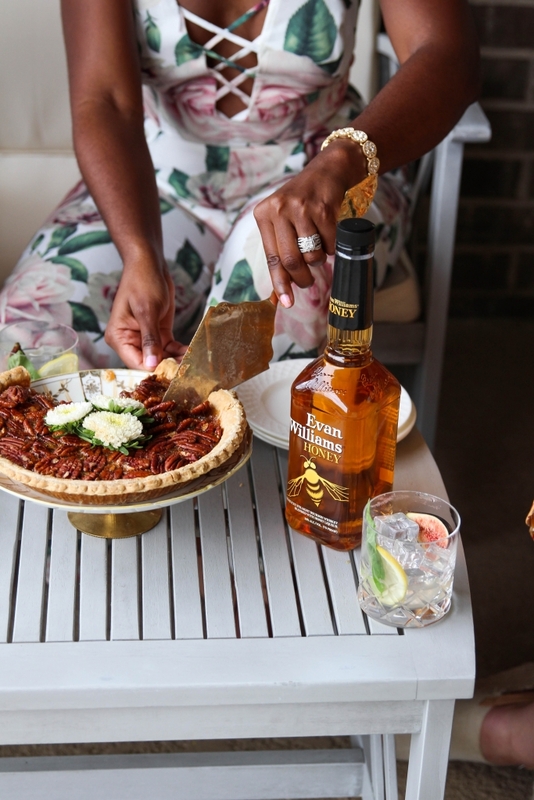 After drinks were poured and pie was served, good old fashioned Southern hospitality did the rest. Everyone was ease and relaxation, enjoying the setting, delicious drinks, and great company. 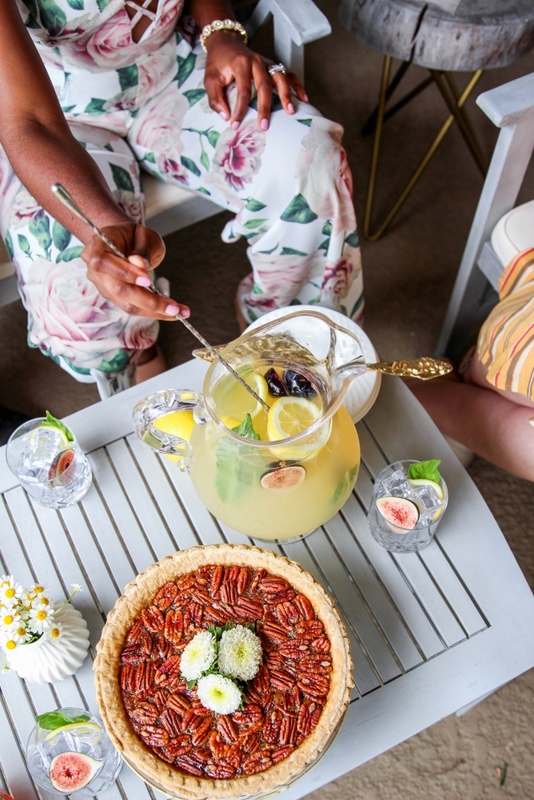 A quite perfect Southern Patio Spring Fling in my book! 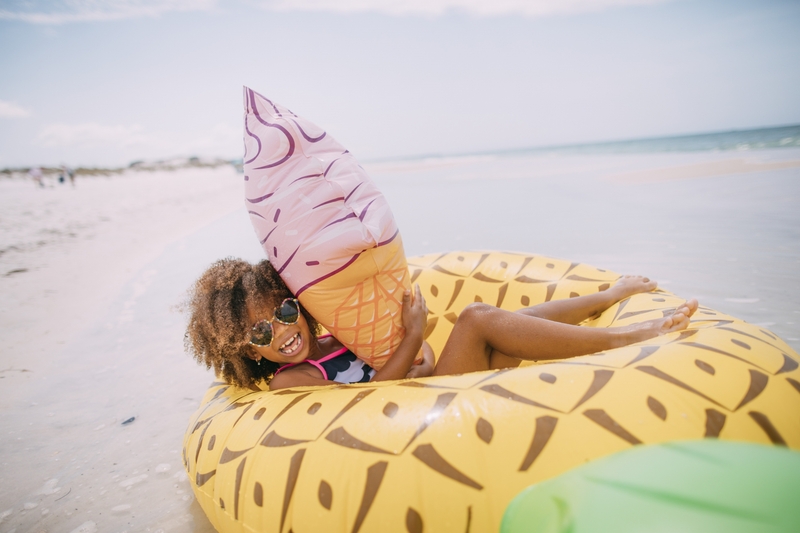 So tell me, what is your favorite way to ring in a new season? Do you go on an outdoor adventure? 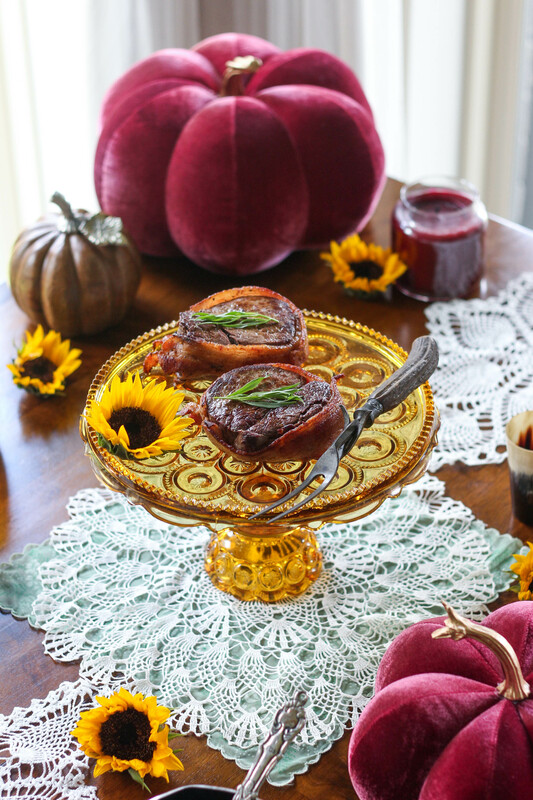 Bake a seasonal pie? Or are you also going to throw a shindig with friends? 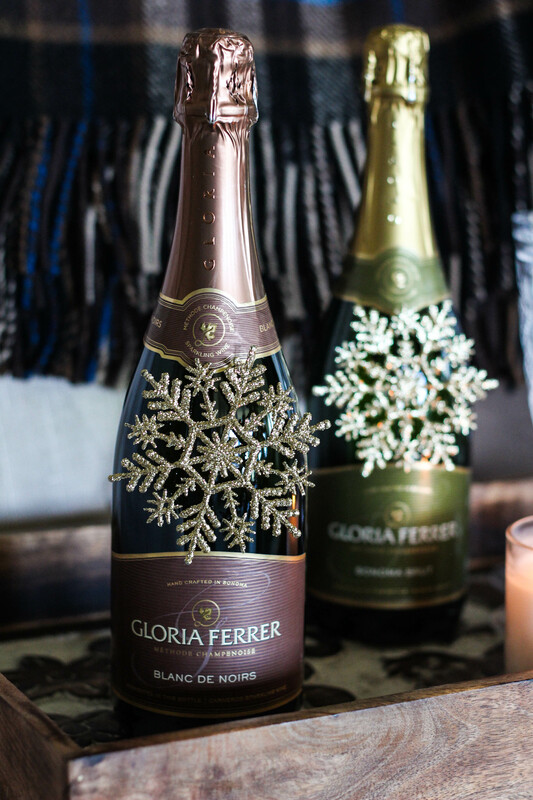 Shout it out below in the comments section and let me know how you celebrate the season. Seriously, I love trying new things so I want your ideas. 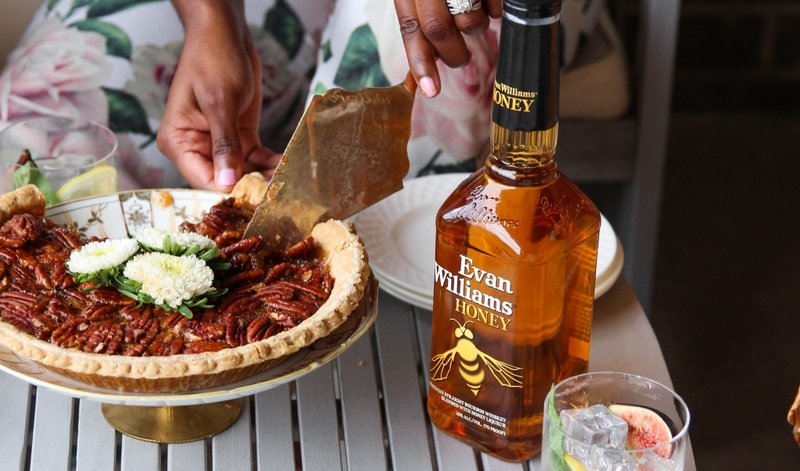 And don’t forget to have a few bottles of Evan Williams Honey on hand for all your spring festivities. 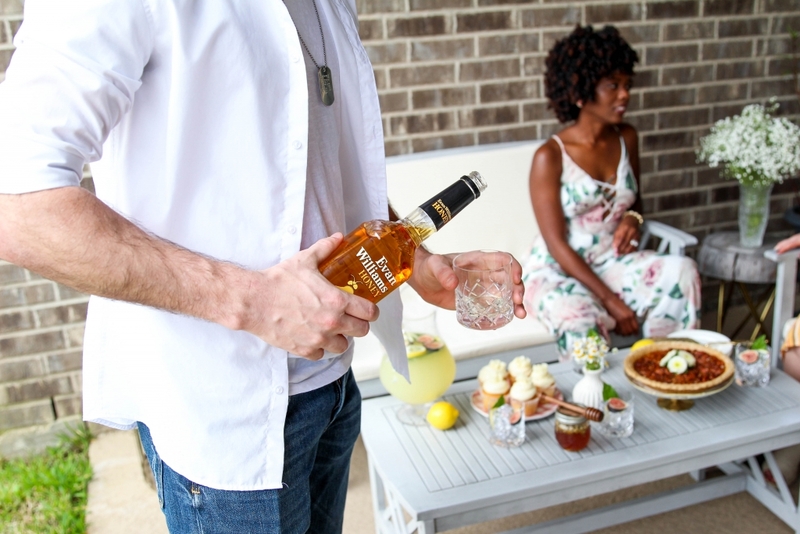 It is a fun and unique whiskey that it sure to bring smiles to your Patio Spring Fling. Honey whisky and lemonade? Sounds amazing! This sounds yummy and a great spring drink. 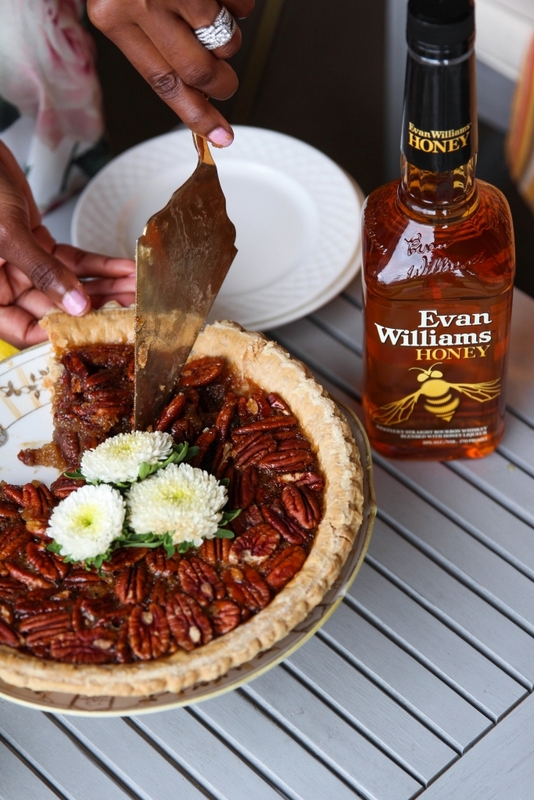 I love honey, and that pecan pie looks so good. I would love to try the honey whiskey lemonade!